We suggest heading there right before sunset to see the trees light up. Located inside the Botanic Gardens, this gorgeous display of orchids covers three hectares! A contemporary greenhouse that serves as a much-needed reprieve from the scorching sun. Plus, it's freaking beautiful. Arguably the most colorful spot in Singapore! This is the last surviving Chinese villa in Little India. The Ministry of Culture promotes volunteerism, heritage, and other community activities among the youth. 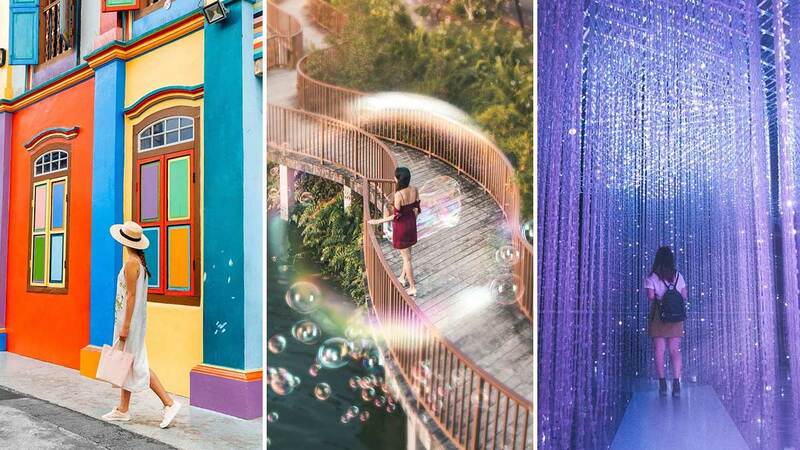 Complete transparency: This is just a trending #OOTD spot among Singaporean millennials, LOL! But there is actually so much to see on Arab St.
Can you believe this is part of an actual school? Just look for Nanyang Technological University of Singapore! This road is famous for its Instagram-worthy murals. This park has four areas, each catering to a different type of visitor: Nature Cove, Recreation Zone, Heritage Zone, and Green Gallery. The ArtScience Museum is part of Marina Bay Sands, and the most photographed spot right now is an installation called Future World: Where Art Meets Science. This complex used to be a convent; it now houses an art gallery, shops, and restaurants. Haji Lane has been gaining a lot of attention lately. Those who want to leave Singapore with more unique remembrances should definitely stop by. Not a lot of people know about this spot, but in this gallery is a miniature version of Singapore. SO. COOL. A prettier, cleaner, and less crowded version of Clarke Quay (IMHO). A gorgeous colonial-style hotel...it's obviously not the cheapest place to visit, but hey, photos are free. LOL!